Although 30 of the 35 necessary states had already endorsed the ERA, by 1977 it appeared that some of the states in which the AEA meeting was scheduled to be held were not keen on ratifying the amendment. 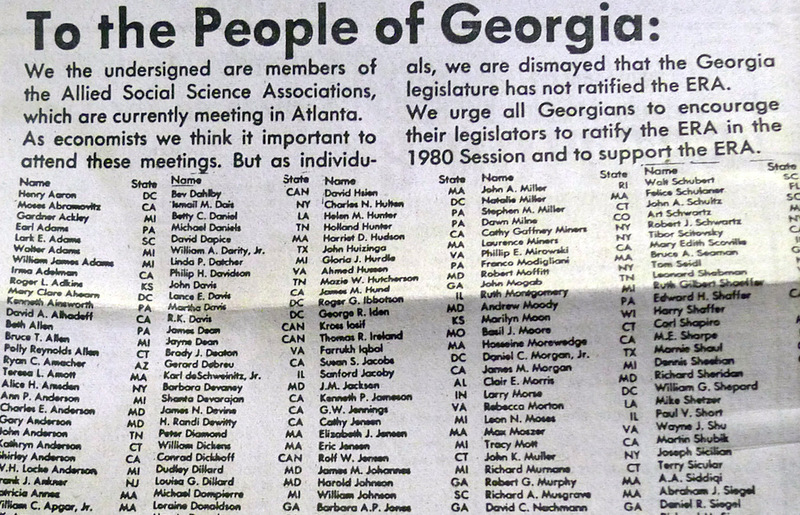 These included Illinois (1978 Chicago meeting) and Georgia (1979 Atlanta meeting). The AEA’s Committee for the Status of Women in the Economics Profession thus proposed to relocate the meetings. Controversy over relocating was not new. In 1968 already, following the riots at the Democratic National Convention, many economists wrote to the AEA to move the meetings from Chicago in protest. The AEA didn’t, but the Econometric Society moved its meetings to Northwestern and a separate job market was organized by Lawrence Klein at the University of Pennsylvania. CSWEP chairwoman Ann Friedlaender, the first woman to become a full professor in economics at MIT (on a joint appointment with engineering), defended the move before the Executive Committee in December 1977. Discussion was heated, with any move from the AEA framed as violating the association’s charter, which stipulated that “the association as such will take no partisan attitude.” Financial consequences (viz. breaking already-signed contracts concerning conference facilities) were also discussed. A motion to withdraw from Atlanta, named the Samuelson-Behrman resolution, failed to pass. The next day, further possibilities for protest were discussed at a CSWEP open meeting. Boycotting the meeting was excluded, as it would harm women in sessions and on the job market. However, it was suggested to organize a session on the “economic power of women” at the next meeting, to pressure the AEA Executive Committee in reconsidering moving the meeting elsewhere, and to take out an ad in the local newspaper during the meeting, signed by economists, providing information on the impact of ERA. CSWEP members also discussed the possibility to relocate only the job market sessions to ERA-favorable states. But getting the Executive Committee to formulate a public position on this issue was CSWEP’s main target. Friedlaender urged AEA members to “let their feelings known to the association.”, Over four hundred economists wrote to AEA President Tjalling Koopmans. Some urged disregarding ERA in site selection, but most letters supported moving the conference to ratifying states. “While the AEA should strive to be apolitical, by its very nature it should also be exemplar in its posture relative to certain basic values,” a female professor wrote. On behalf of 26 MIT economists, Paul Samuelson sent a letter proposing that “the Association should explore the possibility of changing the Atlanta meeting” and that it “should make a formal statement that it will not hold future conventions is states that have not ratified ERA … we understand that many other associations … have managed to change their meeting sites, and we urge the American Economic Association to take a positive stance on this important issue,” they conclude. “Support of the passage of ERA is not fundamentally a political action,” Friedlaender urged. Again, the Executive Committee feared, to quote another letter by Northwestern’s Mary Alice Schulman, that “selecting sites to further a political measure would set a dangerous precedent to locate future conventions on the basis of whether the state had a clean bill-of-health on political issues of some interest to some portion of our membership – migrant worker rights, abortion laws, labor laws, civil liberty issues, etc.” Again, the motion was voted down, but the Executive Committee promised to select future locations more thoughtfully. Koopmans published a long letter explaining he decision in the June AER issue. Outside pressures on the AEA continued to mount. Sophie Korczyk from the Congressional Budget Office complained to Friedlander that “it is sad that the profession of John Stuart Mill, one of the earliest feminist thinkers, should be absent from this crucial forum. I have seen several lists of associations boycotting unratified states, but the AEA is absent from all of them.” The American Association for the Advancement of Science, the American Political Science Association, and the American Psychological Association moved their meetings out of non-ratifying states. In fact, a national campaign by women’s organizations targeted professional and academic organizations, using questionnaires to inform the network. Koopmans and Solow suggested to organize a session on the economic implications of ERA. At the December 1979 Atlanta meeting, CSWEP eventually sponsored a session on “two earner family,” with contributions by Janice Madden, Julie A. Matthei, Ed Lazear, and Robert Michael. The session on the economic consequences of ERA had also been set up: “Women’s place in the labor market: will ERA matter?” featured Marianne Ferber (chair), Heidi Hartmann, Jim Heckman, Peter Bonavitch, and Frank Stafford; Lawrence Kahn, Michael Reich, and Myra Strober as discussants. Former CSWEP executives, including Carolyn Bell, Barbara Bergman, Walter Heller, Kenneth Galbraith & Kenneth Boulding were among the first to sign. They were joined by almost a thousand others, including Irma Adelman, Ann Carter, Robert Engle, Anne Krueger, Wassily Leontief, Abba Lerner, Janice Madden, Franco Modigliani, Ronald Oaxaca, Alice Rivlin, Margaret Simms, Myra Strober, James Tobin and Marina Whitman. The Executive Committee eventually voted that the AEA schedule all annual meetings in ratified states though 1985. Georgia never ratified the ERA.